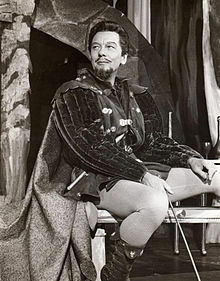 Sir John Gielgud, OM, CH (/ˈɡiːlɡʊd/; 1904–2000) was an English actor and theatre director. He appeared on stage, television and radio and in film in a career that spanned eight decades. Film historian Brian McFarlane, writing for the British Film Institute, wrote of Gielgud that "in terms of the performing arts, it is no exaggeration to say that he towered over the century". Gielgud, a member of the theatrical dynasty the Terry family, began working on stage in 1921 before attending the Royal Academy of Dramatic Art. After completing his studies he worked in repertory theatre and in the West End before establishing himself at the Old Vic in the 1930s. He continued working on the stage until 1990 both as a director and actor. Although he made some films early in his career, he did not start working regularly in the medium until he was in his sixties; in the course of just over thirty years between 1964 and 1998 he appeared in over sixty films. He was active on television and radio, appearing in numerous plays and interviews, and was also in demand as a narrator. Gielgud is one of the few people who have won all four major annual American entertainment awards, these being an Oscar (for Arthur, 1981); an Emmy, (for Summer's Lease, 1991); a Grammy (for Ages of Man, 1979); and Tony Awards (for The Importance of Being Earnest, 1948; Ages of Man, 1959; Big Fish, Little Fish, 1961). He also won BAFTAs, (for Julius Caesar, 1953; Murder on the Orient Express, 1975; special Fellowship award, 1992); Golden Globes, (for Arthur and War and Remembrance, 1988); and a Laurence Olivier Award (Special Award, 1985). He died on 21 May 2000, at the age of 96. This table contains Gielgud's known professional theatrical roles. It also contains the occasions when he both acted and directed. It does not contain those productions where Gielgud was a director but did not appear on stage. Gielgud and Margaret Leighton in Much Ado About Nothing. This table contains Gielgud's stage work as a director. It does not include those productions in which he also appeared, which are shown in the table above. Gielgud took part in numerous radio broadcasts in his career, including interviews, poetry readings and talks about the theatre and acting. The following is a list of plays in which he was involved. DuPont Show of the Month: "The Browning Version"
Play of the Week: "The Rehearsal"
The Wednesday Play: "The Mayfly and the Frog"
Play of the Month: "Romeo and Juliet"
Star Performance: "From Chekhov with Love"
Play of the Month: "Saint Joan"
Omnibus: "The Actor's Changing Face"
Hallmark Hall of Fame: "Hamlet"
Menace: "Deliver us from Evil"
Shades of Greene: "Special Duties"
Play of the Month: "The Picture of Dorian Gray"
Personality and Learning: "The Grand Inquisitor"
Play of the Month: "Heartbreak House"
Tales of the Unexpected: "Neck"
The British Greats: "Jack Hawkins"
Tales of the Unexpected: "Parson's Pleasure"
Omnibus: "Parrots, Bees, Ducks and Finches"
Hallmark Hall of Fame: "Hunchback of Notre Dame"
Play of the Month: "The Critic"
The South Bank Show: "Laurence Olivier – A Life"
Screen Two: "Time After Time"
The Theban Plays by Sophocles: "Oedipus the King"
The Theban Plays by Sophocles: "Antigone"
The South Bank Show: "Hamlet"
The South Bank Show: "Hindemith – A Pilgrim's Progress"
The South Bank Show: "Noel Coward: A Profile"
Inspector Morse: "The Twilight of the Gods"
Under the Hammer: "The Fatal Attribution"
The Inspector Alleyn Mysteries: "Hand In Glove"
Edmond O'Brien (Casca, left) and Gielgud (Cassius) in Julius Caesar (1953), for which Gielgud won a BAFTA for Best British Actor. ^ The award was given "for contribution to theatre for his extraordinary insight into the writings of Shakespeare as demonstrated in his one-man play, Ages of Man". ^ a b McFarlane, Brian. "Gielgud, John (1904–2000)". Screenonline. British Film Institute. Retrieved 4 March 2014. ^ Morley & Sharp 2004. ^ "For the Record". Daily Variety. 19 March 1999. p. 56. ^ a b "The 54th Academy Awards (1982) Nominees and Winners". Oscar Legacy. Academy of Motion Picture Arts and Sciences. Retrieved 25 February 2014. 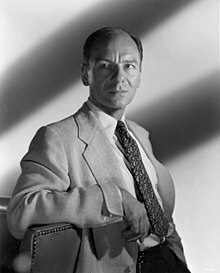 ^ a b c d e f "John Gielgud". Academy of Television Arts & Sciences. Retrieved 25 February 2014. ^ a b Croall 2011, p. 686. ^ a b Somlyo 2001, p. 5. ^ a b c d e f g h i j "BAFTA Awards Search". British Academy of Film and Television Arts. Retrieved 25 February 2014. 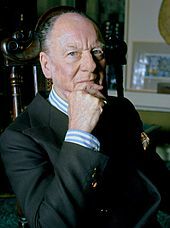 ^ a b c d "John Gielgud". Hollywood Foreign Press Association. Retrieved 25 February 2014. ^ a b "Olivier Winners 1985". The Society of London Theatre. Archived from the original on 19 April 2012. Retrieved 25 February 2014. ^ Who Was Who 2012. ^ a b Brandreth 1994, pp. 171–77. ^ a b Morley 2001, pp. 459–73. ^ Croall 2000, pp. 534–38. ^ a b Herbert 1978, pp. 646–49. ^ Sadie, Stanley (17 March 1967). "Vigorous Stravinsky". The Times. London. p. 12. ^ Croall 2000, pp. 538–40. ^ Croall 2000, p. 545. ^ Croall 2000, p. 544. ^ a b c Morley 2001, p. 473. ^ "Who Is the Man? (1924)". British Film Institute. Retrieved 19 February 2014. ^ "The Clue of the New Pin (1929)". British Film Institute. Retrieved 19 February 2014. ^ "Insult (1932)". British Film Institute. Retrieved 19 February 2014. ^ "The Good Companions (1933)". British Film Institute. Archived from the original on 3 March 2014. Retrieved 19 February 2014. ^ "Secret Agent (1936)". British Film Institute. Retrieved 19 February 2014. ^ "The Prime Minister (1941)". British Film Institute. Retrieved 19 February 2014. ^ "An Airman's Letter to His Mother (1941)". British Film Institute. Retrieved 19 February 2014. ^ "Unfinished Journey (1944)". British Film Institute. Retrieved 19 February 2014. ^ "Julius Caesar (1953)". British Film Institute. Retrieved 19 February 2014. ^ "Romeo and Juliet (1954)". British Film Institute. Retrieved 19 February 2014. ^ "Richard III (1955)". British Film Institute. Retrieved 19 February 2014. ^ "Around the World in 80 Days (1956)". British Film Institute. Retrieved 19 February 2014. ^ "Saint Joan (1957)". British Film Institute. Retrieved 19 February 2014. ^ "The Barretts of Wimpole Street (1956)". British Film Institute. Retrieved 19 February 2014. ^ "Becket (1964)". British Film Institute. Retrieved 19 February 2014. ^ "Hamlet (1964)". British Film Institute. Retrieved 19 February 2014. ^ "The Loved One (1965)". British Film Institute. Retrieved 19 February 2014. ^ Croall 2000, p. 541. ^ "Assignment to Kill (1967)". British Film Institute. Retrieved 19 February 2014. ^ "Revolution D'Octobre (1967)". British Film Institute. Retrieved 19 February 2014. ^ "The Shoes of the Fisherman (1968)". British Film Institute. Retrieved 19 February 2014. ^ "Sebastian (1967)". British Film Institute. Retrieved 19 February 2014. ^ "The Charge of the Light Brigade (1968)". British Film Institute. Retrieved 19 February 2014. ^ "Oh! What a Lovely War (1969)". British Film Institute. Retrieved 19 February 2014. ^ "Julius Caesar (1970)". British Film Institute. Retrieved 19 February 2014. ^ "Eagle in a Cage (1970)". British Film Institute. Retrieved 19 February 2014. ^ "Lost Horizon (1972)". British Film Institute. Retrieved 19 February 2014. ^ "11 Harrowhouse (1974)". British Film Institute. Retrieved 19 February 2014. ^ "Murder on the Orient Express (1974)". British Film Institute. Retrieved 19 February 2014. ^ "Gold (1973)". British Film Institute. Retrieved 19 February 2014. ^ "Galileo (1974)". British Film Institute. Retrieved 19 February 2014. ^ "Aces High (1976)". British Film Institute. Retrieved 19 February 2014. ^ a b c Brandreth 1994, p. 178. ^ "Joseph Andrews (1976)". British Film Institute. Retrieved 19 February 2014. ^ "A Portrait of the Artist as a Young Man (1977)". British Film Institute. Retrieved 19 February 2014. ^ "Providence (1977)". British Film Institute. Retrieved 19 February 2014. ^ "Richard II (1978)". British Film Institute. Retrieved 19 February 2014. ^ "Les Misérables (1978)". British Film Institute. Retrieved 19 February 2014. ^ "Murder by Decree (1978)". British Film Institute. Retrieved 19 February 2014. ^ "Caligula (1979)". British Film Institute. Retrieved 19 February 2014. ^ "The Human Factor (1979)". British Film Institute. Retrieved 19 February 2014. ^ "The Elephant Man (1980)". British Film Institute. Retrieved 19 February 2014. ^ "Sphinx (1980)". British Film Institute. Retrieved 19 February 2014. ^ "The Formula (1980)". British Film Institute. Retrieved 19 February 2014. ^ "Lion of the Desert (1980)". British Film Institute. Retrieved 19 February 2014. ^ "Arthur (1981)". British Film Institute. Retrieved 19 February 2014. ^ "Priest of Love (1980)". British Film Institute. Retrieved 19 February 2014. ^ "Chariots of Fire (1981)". British Film Institute. Retrieved 19 February 2014. ^ "Gandhi (1982)". British Film Institute. Retrieved 19 February 2014. ^ "Buddenbrooks (1979)". British Film Institute. Retrieved 19 February 2014. ^ "Scandalous (1983)". British Film Institute. Retrieved 19 February 2014. ^ "The Wicked Lady (1983)". British Film Institute. Retrieved 19 February 2014. ^ "The Scarlet and the Black (1983)". British Film Institute. Retrieved 19 February 2014. ^ "Invitation to the Wedding (1983)". British Film Institute. Retrieved 19 February 2014. ^ "Wagner (1983)". British Film Institute. Retrieved 7 March 2014. ^ "Plenty (1985)". British Film Institute. Retrieved 19 February 2014. ^ "Romance on the Orient Express (1985)". British Film Institute. Retrieved 19 February 2014. ^ "Leave All Fair (1985)". British Film Institute. Retrieved 19 February 2014. ^ "The Canterville Ghost (1986)". British Film Institute. Retrieved 19 February 2014. ^ "The Whistle Blower (1986)". British Film Institute. Retrieved 19 February 2014. ^ "Barbablú, Barbablú (1987)". British Film Institute. Retrieved 19 February 2014. ^ "Appointment with Death (1988)". British Film Institute. Retrieved 19 February 2014. ^ "Arthur 2: On the Rocks (1988)". British Film Institute. Retrieved 19 February 2014. ^ "Getting it Right (1989)". British Film Institute. Retrieved 19 February 2014. ^ "Prospero's Books (1991)". British Film Institute. Retrieved 19 February 2014. ^ "Shining Through (1992)". British Film Institute. Retrieved 19 February 2014. ^ "Swan Song (1992)". British Film Institute. Retrieved 19 February 2014. ^ "The Power of One (1992)". British Film Institute. Retrieved 19 February 2014. ^ "First Knight (1995)". British Film Institute. Retrieved 19 February 2014. ^ "Haunted (1995)". British Film Institute. Retrieved 19 February 2014. ^ "The Portrait of a Lady (1996)". British Film Institute. Retrieved 19 February 2014. ^ "Hamlet (1996)". British Film Institute. Retrieved 19 February 2014. ^ "Shine (1996)". British Film Institute. Retrieved 19 February 2014. ^ "Elizabeth (1998)". British Film Institute. Retrieved 19 February 2014. ^ "Quest for Camelot (1998)". British Film Institute. Retrieved 19 February 2014. ^ "Sergei Rachmaninov: Memories (1999)". British Film Institute. Retrieved 19 February 2014. ^ "Quest for Camelot (2000)". British Film Institute. Retrieved 19 February 2014. ^ "Filmography: Gielgud, John". British Film Institute. Retrieved 4 March 2014. ^ Brandreth 1994, pp. 178–80. ^ Morley 2001, pp. 474–77. ^ Croall 2000, pp. 542–43. ^ "Broadcasting". The Times. London. 6 January 1972. p. 19. ^ a b c d e f "John Gielgud". Tony Award Productions. Retrieved 25 February 2014. ^ a b c d "Sir John Gielgud". Gielgud Films. Retrieved 26 February 2014. ^ "The 37th Academy Awards (1965) Nominees and Winners". Oscar Legacy. Academy of Motion Picture Arts and Sciences. Retrieved 25 February 2014. ^ a b Croall 2011, p. 531. ^ "News". Drama. British Theatre Association (112–15): 13. 1974. ^ "New York Film Critics Circle Awards: 1977 Awards". New York Film Critics Circle. Retrieved 25 February 2014. ^ "New York Film Critics Circle Awards: 1981 Awards". New York Film Critics Circle. Retrieved 25 February 2014. ^ "7th Annual Los Angeles Film Critics Association Awards". Los Angeles Film Critics Association. Retrieved 25 February 2014. ^ a b "Domestic News". United Press International. 11 January 1983. ^ a b "A Complete List of Grammy Nominees". Associated Press. 10 January 1984. ^ "11th Annual Los Angeles Film Critics Association Awards". Los Angeles Film Critics Association. Retrieved 25 February 2014. ^ "Domestic News". United Press International. 8 January 1987. ^ "Domestic News". Associated Press. 12 January 1989. ^ "Domestic News". Associated Press. 11 January 1990. ^ "Domestic News". Associated Press. 8 January 1992. Brandreth, Gyles (1994). 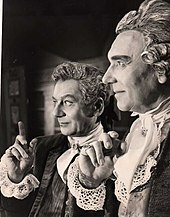 John Gielgud, A Celebration. London: Pavilion Books. ISBN 978-1-85793-287-4. Croall, Jonathan (2011). John Gielgud: Matinee Idol to Movie Star. London: A & C Black. ISBN 978-1-4081-3106-0. Herbert, Ian (1978). Who's Who in the Theatre: a Biographical Record of the Contemporary Stage. London: Pitman Publishing. ISBN 978-0-273-01195-8. Morley, Sheridan (2001). John G – The Authorised Biography of John Gielgud. London: Hodder & Stoughton. ISBN 978-0-340-36803-9. Somlyo, Roy (2001). The Tony Award: a complete listing of winners and nominees of the American Theatre Wing's Tony Award with a history of the American Theatre Wing. London: Heinemann. ISBN 978-0-325-00294-1. This page was last edited on 13 March 2019, at 14:14 (UTC).